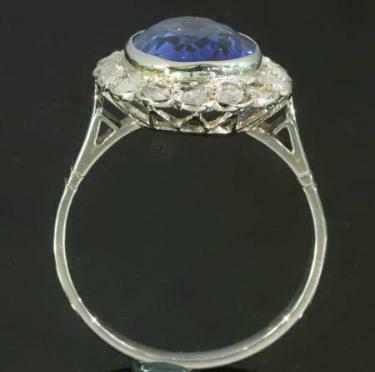 Jewel of the Month for November 2009, is a Sapphire & Diamond Engagement Ring in the same style as the Diana Princess of Wales Famous Engagement Ring. Although it does not carry any legible control marks Adin believes it to be of Belgian origin. Material: 18K white gold - In very recent years such rings have sometimes been made en suite as a matching pair of similar style.Antique gemstone engagement rings are rapidly gaining in popularity and are a great investment. Jewel of the Month has a distinct advantage over princess Diana's engagement ring; this engagement ring contains Antique Diamonds! 16 rose cut diamonds! Adin says, the weight of the diamonds is unknown, which is normal in our trade when it comes to rose cuts. Precious Stones: One sapphire (lab produced) (also called verneuil sapphire). The condition is excellent condition. The dimensions are: head of the ring 1.73 cm (0.68 inch) x 1.47 cm (0.58 inch) Weight: 4.40 gram (2.83 dwt) Ring size Continental: 57 & 18¼ , Size US 8 , Size UK: P½ Resizing: (I believe Adin only charge for extreme resizing).